CPR training manikin family pack. This professional use CPR training manikin set is packed full of easy to use features to deliver realistic CPR training across a range of adult, child and infant models. Fast and simple clamshell torso that accommodates and easy to install face shield lung bag for minimumn fuss and set up. CPR Rate monitor gives students and instructors instant feedback regarding the rate of chest compressions. An Audible clicker is also fitted so that only a correct and full chest compression to the appropriate depth causes the audio feedback giving students experience of the true force needed to deliver real life chest compressions. Lightweight and less than half the weight of the nearest competitor means that it is more effective to ship, easy to move around and places less fatigue on the instructor. This set is part of a range that includes a multi-pack of four adult torso CPR manikins (for classroom training) and a single adult torso CPR manikin. 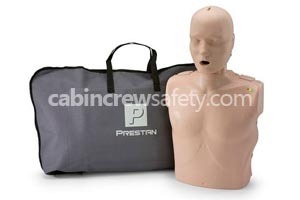 As with all CPR manikins the family pack ships with a carry case for easy stowage and protection. This cpr training manikin family pack is supplied as un-certified representative training equipment. 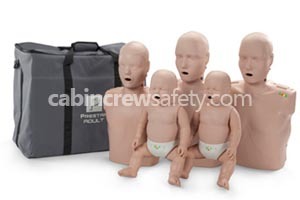 Looking for a CPR training manikin family pack for flight operations end use? We're here to help with all of your equipment needs. Not only with this CPR training manikin family pack but any other parts, equipment and reference training devices that you may require.